So it’s been a little while since coming on here - I haven’t had hamsters for a while. Thought I’d re introduce myself and my robo Chocho who I’ve had for a few months after her previous owners didn’t want her anymore. She should be around a year old now. She does not like human contact in any way shape or form unless I happen to be holding mealworms. So apart from getting her out every so often I mainly leave her be - she seems happy though so that’s all that matters! Not entirely sure she even enjoys time out of her cage. Hello and welcome back to HC, I guess lol! Chocho is such a beautiful lady! That's so cute that her favorite thing is eating. Robos are always so cute and I just love their little way of walking! She is the cutest! Chocho is adorable, she looks very sweet eating there & it sounds as though she's happy doing her own thing! Some Robos don't really become hand tame but are quite content to just stay in their cages with plenty of enrichment to keep them busy. Welcome back to HC! 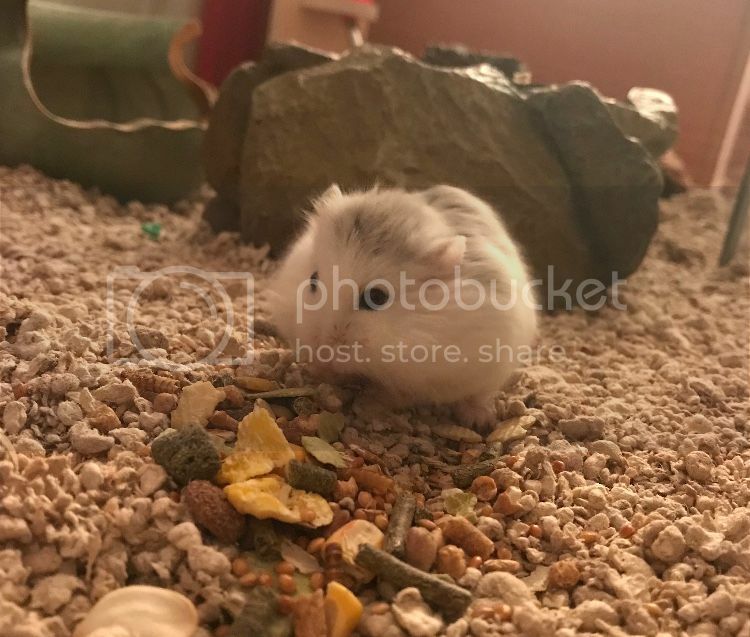 I'm so glad that Choco has stolen your heart and you are no longer hamsterless. Choco is absolutely adorable and looks extra, extra fluffy. Great name, btw! She sounds extremely content eating and hamstering around in her cage. I look forward to seeing you around the forum and getting to know your little fluff ball. Aww gorgeous 😀 It is lovely that chocho has found a loving new home and is happy doing her own thing. Thanks all! May try getting her used to handling again will see how it goes. Would like to find a playpen or enclosure that is larger than her cage but not found anything as of yet. Have also put together a small clip of her, eating of course. Aww, Mocho looks so cute in that video of her doing what she loves best - eating! She really is entertaining doing it, and she made me giggle. She is such a cutie!!! If you decide to try taming and handling again, I do wish you both all the very best and certainly hope that it is successful this time. Fingers crossed!! If you're in the Uk Zooplus do a good wooden playpen which is safe, escape proof & should be large enough, the wire ones & the DIY ones made with storage cubes may not be escape proof so probably not worth the risk. Choco is such a cutie my friend. Congratulations! Thank you cypher that one looks nice and escape proof may need to invest in it! Would be that or two sets of the traditional barred ones that link up but always been a bit wary of those ones even if she can’t climb.